Ketchikan, Alaska - It was big news in little Ketchikan recently when giant Alaska Communications System (ACS) expressed interest in buying the citizen-owned KPU Telecom division. Because the Ketchikan's utility systems are owned by the municipality, such a sale would require a vote of the residents of the isolated island town of 8,000 located on the shores of Southeastern Alaska's Inside Passage. It was not the first such offer. In 1996 the city's voters turned down a similar bid, a $30.2 million offer for the phone company, from PTI Communications, which later became part of ACS. So it appears that KPU Telecom is a money-maker, and would the voters approve such a deal? Have the people given up enough of their habitual mistrust of the city fathers to trust them to negotiate the deal? Are the people interested enough and savvy enough to vote on such an offer? Well, who would have believed even a dozen years ago that so many Ketchikan folks of all ages, some who had never even seen a monitor or keyboard back then, would be tapping out e-mails, zapping spam, and searching Google for answers to questions they'd never even thought of before. A kpunet.net "address" has become trendy, perhaps with just a touch of loyalty to the community. That attitude could be considered strange in light of Ketchikan's 70-year-old love-hate relationship with its municipal utility company. 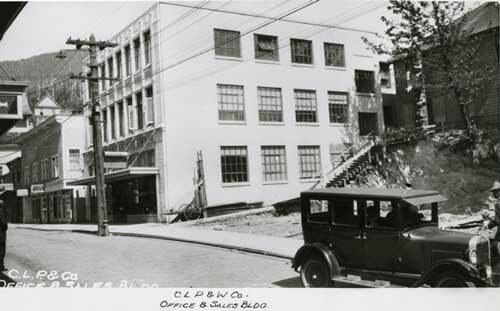 It was back in 1935 that the City of Ketchikan, population then about 4,000, bought the privately owned and Depression-stressed Citizens Light and Power Co. - which included the three divisions: electricity, water and telephone. The name was changed to Ketchikan Public Utilities (KPU) - and thus the citizenry began its KPU-bashing habits. There were many who had been opposed the KPU purchase on principle, objecting to its political implications, and over the years even more who voiced almost-inherited gripes about rates and services. The telephone division of KPU has perhaps suffered the fewest complaints. For many years Ketchikan complained about too many power blackouts, memories of holiday turkeys left half-roasted during long outages, disgust with 10-partly phone lines outside the city limits, and even perpetuated a myth that KPU kept a dead eagle on ice to be pulled out as proof that yet another outage was caused by a kamikaze eagle in the power lines! But all those concerns were met and largely remedied in the final two decades of the 20th century with a modern new dam and replaced power lines. Still, Ketchikan memories are long! In spite of its small size, Ketchikan had never really been behind for long when it comes to communications. There was a Marconi wireless tower at the hillside top of Upper Main Street as early as 1906 to bring in messages via the dots and dashes of Morse code! By 1909 the city had telephones, although long distance calling was still in the future. 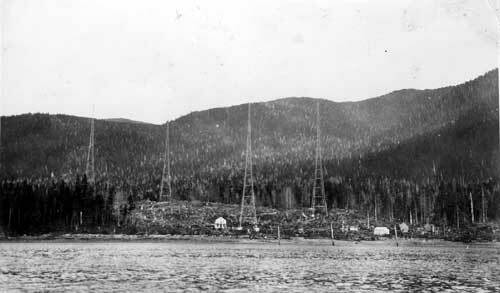 By the years of WWI, Ketchikan was the wireless relay station for the North Pacific region with twin towers and accompanying buildings at the then-end of Tongass Avenue. The invention of radio brought new technology into the picture. Alaska Communications System is not a new name to Ketchikan! There has been an ACS presence for a very long time, although under a number of other names and acronyms - including WAMCATS, the ancestor of present communications in Alaska. WAMCATS was the Washington-Alaska Military Cable And Telegraph System. It was WAMCATS that strung the overland "talking wire" across Alaska wilds and linked it to a submarine cable that connected to Seattle. Communication was big then and had been even 35 years earlier. At the time there had been a doomed effort, in 1865, by entrepreneur Perry Collins to string a telegraph wire from San Francisco to British Columbia, thence through Russian-America to the Yukon River and across the narrow Bering Strait to link with the completed Trans-Siberia cable. It was an effort to create west-to-east communication system to the Old World in time to beat the struggling Cyrus Field attempt to complete the laying of the east-to-west Trans-Atlantic submarine cable. Cyrus Field won, and the Western-Union-financed Perry Collins Alaska-Russia effort was abandoned. Nome was the new Gold Rush boom town when WAMCATS soldiers of the Army Signal Corps strung the first "talking" wire between Nome's Military Headquarters and the Port Safety outpost. By 1903, the men had strung landlines that connected western Alaska to Prince William Sound, the Interior and Southeast. Those early Arctic region lines that carried Morse Code were replaced in some areas by radio signals in 1903. And by 1905 WAMCATS could count 1500 miles of land lines, 2,000 miles of submarine cable, and 107 miles of wireless links in its network. Although the initial Canadian Klondike bonanza of the Gold Rush of '98 had long since played out, new gold discoveries were being discovered in locations all across Alaska in the following years. The resulting boom towns blossomed temporarily with people and law enforcement problems, and the WAMCATS lines linked the Alaska's far-flung outposts to San Francisco and Washington military headquarters. The military allowed commercial and non-military traffic on its system, provided it did not interfere with military operations. This additional usage and subsequent increase in commercial traffic led to a radio-telegraph link with Ketchikan and established it as the main relay point between Seattle and Seward. By 1916 half of the WAMCATS land lines had been abandoned in favor of wireless stations, which reduced costs and increased communications reliability. Then in the 1920s, radio came to Alaska. The fabulous excitement of the Alaska Gold Rush of '98 and Alaska's fame and notoriety faded into a future of little or no growth. In the 1930s the remaining "talking wires" in Alaska's far reaches were replaced by radio and changing technology. In 1936 the U.S. Congress changed the name of WAMCATS to the Alaska Communications System (ACS). Then in 1941 came World War II and the war in the Pacific. Alaska's geographic importance to the nation became very evident with the 1942 invasion and occupation by the Japanese of two of Alaska's Aleutian Islands. It was feared these enemy-occupied Aleutian islands would become the first of a series "stepping stones" to an enemy invasion of America's West Coast! In 1942 the wartime Alcan (now called the Alaska Highway) was built in record time to ferry war materiel to Alaska's imperiled vastness. Then at the end of the war, communications links with the lower 48 states were upgraded into the mid-1950s when AT&T laid a submarine telephone cable between Ketchikan and Port Angeles, Washington. The postwar years brought more with them, the giant advances in all technology, not just communications expertise. It was a new world of engineering for a technological future. 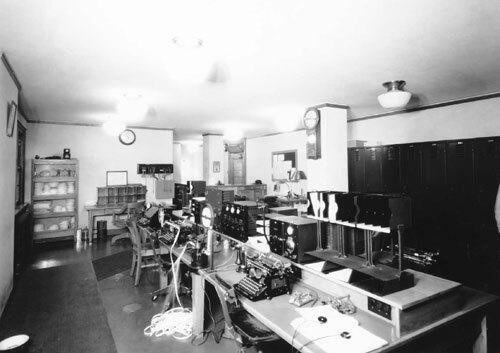 After Alaska was granted Statehood in 1959, there came the Western Electric White Alice Communications System, and after that the Dewline - the Distant Early Warning series of radar stations. The future was arriving. In the late 1970s, the federal government turned the reins of the domestic tele-communcations over to private industry. RCA was the successful bidder at $28.5 in cash and a pledge of to immediately invest and additional $30 million for much-needed improvements to the system. RCA renamed its Alaska operation Alascom. From then on the telecommunications picture blossomed into the major network it is today. But it all started in Alaska with a group of U.S. Signal Corpsmen slapping mosquitoes as they draped wires across the wilderness of sub-Arctic Alaska at the turn of the 20th Century. And it all began in Ketchikan in 1906 with the installation of a giant tower at the top of the Main Street heights, an attraction that must have puzzled small boys and baffled grown men. It may be almost as puzzling deciding whether to vote yea or nay to a formal proposal to sell KPU Telecom - if the issue does indeed come before the voters. Do you suppose there may still be a chunk of two of cement from the base of that 1905 tower, buried somewhere up there on the Main Street hill?